Kiwi Shoe Polish is a paste polish and contains waxes that protect and nourish leather and produces a long-lasting, glossy shine. This is one of the most well-known shoe polishes on the market today. Available in 9 colors. Just apply it with an applicator or a soft cloth, let is set up for a couple of minutes and be absorbed into the leather. Then take your 100% Horse hair shine brush which is the best brush to bring out a brilliant shine to leather. The brushing also distributes the polish into the crack and crevices of the shoe to seal it and protect it from the elements. After you have a nice shine with the brush then buff with a shine cloth and there you go, a beautifully shined shoe. 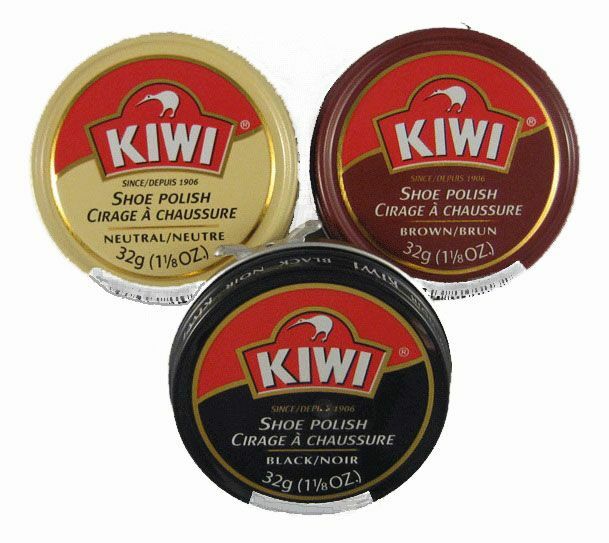 Kiwi Shoe Polish comes in two sizes. The regular size is 1 1/4 oz. and the giant size is 2 1/2 oz. The regular size tin is available in Black, Brown, Neutral, Mahogany, Cordovan, Oxblood, Navy and White. The 2 1/2 oz. is available in Black and Brown. "This is the most famous shoe polish sold in the world today. The white Kiwi bird on the red and black background makes this logo easily recognisable. Kiwi Shoe Polish was widely marketed in the UK and the USA during Wold War I and II. It is now manufactured in the United States. The shoeshinekit usually has all colors available for immediate shipping.